From 2010 to 2011, AKU teams treated over 1.3 million flood victims. The devastating floods that struck Pakistan in July 2010 destroyed vast tracts of agricultural land and hundreds of towns and villages, leaving one-fifth of the country’s arable land under water and 20 million people homeless, most of them subsistence farmers and their families. 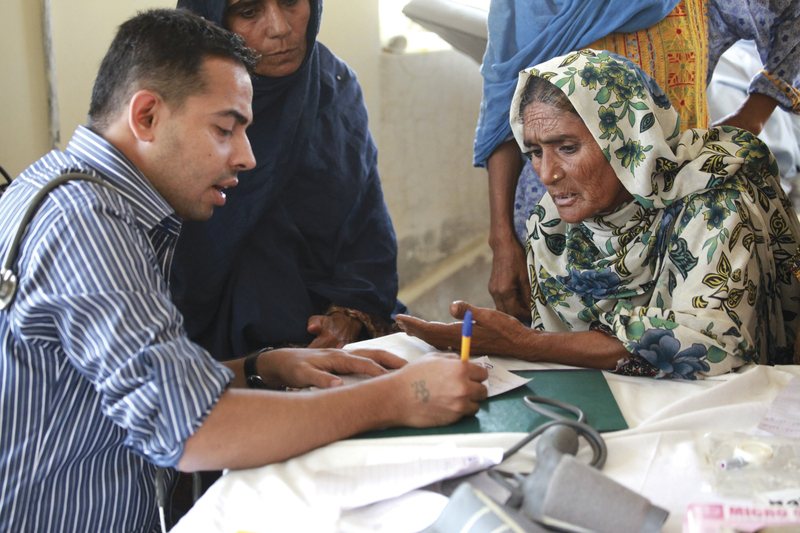 With financial support from the US Agency for International Development, the Aga Khan University (AKU) responded immediately, assembling interdisciplinary teams of healthcare workers and partnering with local district governments and health departments to deliver essential services in 15 districts of Sindh, southern Punjab and Balochistan. From July 2010 to the end of 2011, AKU teams treated over 1.3 million flood victims. AKU’s work placed special emphasis on women and young children, as it provided gynaecological, obstetric and paediatric services, including care for women with pregnancy complications from anaemia and infections. The floods exacerbated many underlying chronic health problems in the impacted communities, particularly malnutrition. A rapid survey of children under five and their mothers in University-run relief centres revealed not only a high proportion of malnourished children but also that almost half of 15- to 49-year-old women were wasted or anaemic. AKU provided ready-to-eat therapeutic foods to women and children at risk. As part of a longer-term nutrition intervention strategy, it also linked women in food insecure households to existing district support mechanisms that provide food or cash assistance. Another long-standing health issue that resurfaced was ignorance of basic hygiene practices. AKU developed a pictorial WASH (water, sanitation and hygiene) manual in Urdu to educate the community. “It worked marvellously in the field,” said Dr Iqtidar A. Khan, Chair of the Flood Response Programme and Professor, Department of Paediatrics and Child Health, Division of Women and Child Health at AKU. “We found the local communities very receptive to our messages on the benefits of hygiene, clean drinking water and proper disposal of home waste. They are now keen to continue to improve their health and hygiene conditions on a self-help basis,” he added. Through these initiatives, AKU and Aga Khan University Hospital brought immediate relief to families devastated by one of Pakistan’s largest natural disasters. Their interdisciplinary approach and work with local partners has also strengthened community engagement for preventive healthcare and reduced the risk of endemic undernutrition in flood-affected areas.